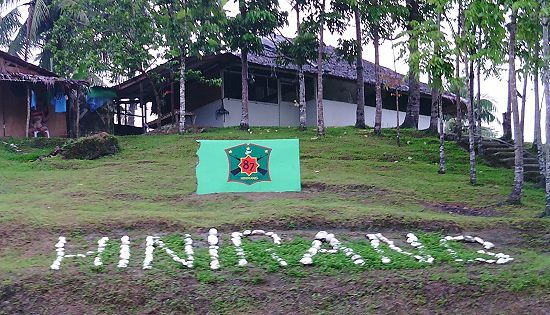 CAMP LUKBAN, Catbalogan City, Samar – The 87th Infantry (Hinirang) Battalion, Philippine Army handed over to DENR Samar a captured Philippine Hawk Eagle in a ceremony held at 87IB Headquarters, Brgy Polangi, Calbiga, Samar. The captured Philippine Hawk Eagle was formally handed over by Maj Gen Jet B Velarmino, Commander of the 8th Infantry (Stormtroopers) Division and Lt Col Antonio B. Dulnuan, Commanding Officer of 87IB to Mr. Danilo A Javier, DENR Regional Technical Director, Protected Area, Wildlife and Coastal Zone Management Service based at Tacloban City. The Philippine Hawk Eagle estimated to be five months old when found by the troops conducting assessment at the hinterlands of Pinabacdao-Sta Rita, Samar area on the effects of the super typhoon Yolanda after it struck the country on November 8, 2013. The troops named the bird “MURAYAW”, a Waray-Waray word which means “Peace” and nursed its leg wounds for four (4) months. After the bird regained its strength, Lt Col. Dulnuan directed his troops to contact DENR and arranged for the bird’s turn over for its eventual return to the wild where it belongs. QUEZON CITY – Describing the Interruptible Load Program (ILP) as "the poor subsidizing the very rich,’’ the Trade Union Congress of the Philippines (TUCP) expressed strong opposition to the program that the Department of Energy (DOE) will operationalize with MERALCO once the "red alert" level indicating a power supply deficit is reached this summer season. Under the ILP, large commercial and industrial corporations, including malls, will run their own generator sets to power up their energy needs for their air-conditioning, lighting and operations as a solution to the anticipated power shortage this summer. This will free-up power supply that MERALCO can use to service the captive residential households and small enterprises within the MERALCO franchise area. Those ILP participants running their own generator sets – the most expensive power source – will then pass through their fuel and maintenance costs to the MERALCO consumers. “Why are MERALCO residential customers going to be made to pay for power they did not use and never consumed in their households? Powering up the malls through their own generators is not a cost incurred by MERALCO that we, the household consumers, actually ended up using. Why will we be made to pay for the air-conditioning of the SM and Robinsons Malls? Anong pakialam natin kung patakbuhin nila o hindi ang mga aircon nila? Kailan naging utang-na-loob natin sa SM o Robinsons na kailangan tayo bilang mga customer ng MERALCO ang singilin para sa air-conditioning nila?” Gerard Seno, executive vice president of Associated Labor Unions-TUCP. He said that this is tantamount to a direct subsidy from the mostly poor and middle-class customers of MERALCO to the participating industries like SM Malls and Robinson Malls owned respectively by the Sy and Gokongwei families. “This appears to be a wily scheme that will benefit most the big shopping mall owners like Henry Sy, Jr. of SM Group and John Gokongwei, Jr. of Robinsons Group who both hold controlling shares in the power industry,” said Mendoza. “We believe that in times of crisis, ALL must sacrifice and ALL must bear the burden. This means including the big businesses, the commercial and industrial sector, not just the poor hapless residential consumers,” added Seno. Henry Sy, Jr. is also the owner of One Taipan Holdings which owns 30% of the National Grid Corporation of the Philippines (NGCP) that has monopoly in the transmission sector in the power industry in the Philippines. John Gokongwei, Jr. on the other hand now owns 27.1% shares in MERALCO which were previously held by the Ramon Ang-led San Miguel. TUCP slammed the scheme, questioning its legality as it has not even gone through the due process of a public hearing at the Energy Regulatory Commission (ERC). “It is as if Meralco and DOE have not learned some lessons from the automatic rate increase last December, it is as if walang natutunan and here they go again implementing a scheme without consulting the public who again be made to shell out hard-earned money for power they are not even directly consuming. ERC created rules on ILP for Visayas and Mindanao. There are no rules for Luzon and yet Meralco is rushing this, he added. "We remind both Government and these oligarchs that capitalism without risk is not part of the social contract. Consumers are not supposed to assume all risks and expenses of the business owners. Consumers never agreed to be their insurers against all risks,” said TUCP Executive Director Luis Corral. “Malls run airconditioning through their own generators at their own cost during brownouts because that is the commercial come-on for them to bring hordes of customers in from whom they will earn profits hands over fist. In the past, they ran their generator sets – without being subsidized by Meralco consumers. But now that these mall operators are also in the power business they want to earn both ways – in fact, in all ways possible – with all costs passed through to the captive MERALCO residential customers. DOE is now giving these businesses a very special “license to kill.” Pinapaalala namin na si Juan dela Cruz ay hindi charitable institution para sagutin ang lahat ng gastusin ng MERALCO at ng power industry. Ano sila sinusuwerte?” Corral explained. Corral warned that the dominant position of the Sy, Gokongwei and Manny Pangilinan groups in the power industry and their equally dominant role in the telecoms, real estate, retail and hospital sectors make ILP rife with conflict-of-interest. "What is DOE thinking? Even the Pangilinan-led TV 5 and Smart Communications will qualify as ILP participants. Consumers will be bled dry on all fronts by a price-gouging MERALCO and by all these ILP participants pretending to do us a good deed. They are not doing MERALCO consumers any favors because they are just really trying to double or triple their profits at our expense" he added. “Why will MERALCO residential customers have to pay for the electricity that SM and Robinsons will use for their airconditioning and lighting? When did subsidizing the already hefty profit margins of SM and Robinsons malls become a social good?” maintained Corral. Corral also expressed apprehension as to why the DOE has even deigned to look at the ILP as a solution to the power shortage problem, instead of setting up strategies and policies to ensure the stable and long-term supply of electricity in the country. "When MERALCO management spectacularly failed to ensure alternative supply for the prescheduled Malampaya shutdown last December, its automatic solution was to charge to the consumers the expensive power it got from the Wholesale Electricity Spot Market (WESM). Now, MERALCO will again make our hapless consumers serve as the insurers and fall guy to cover and answer for all their policy failings and management errors in their highly profitable power racket." “The power companies and big corporations of Sy, Gokongwei, and Pangilinan are not sacrificing, they continue to benefit and are behaving like vultures trying to double their profit during the crisis while the rest of us suffer the double whammy of the heat and the high price of electricity," stressed Corral. CAMP LUKBAN, Catbalogan City, Samar – New People’s Army operating in Northern Samar harassed a CAFGU detachment at Brgy, San Pascual, Catarman, Northern Samar at around 10:35 a.m. on April 14, 2014. Based on the report from the 803rd Infantry Brigade, Philippine Army more or less 10 NPAs positioned themselves 200 to 300 meters from the detachment and started shooting. The CAFGU and military personnel assigned in the detachment did not return fire as the rebels immediately ran away after firing few rounds. No one was reported hurt on both sides. Troops under the 803rd Infantry Brigade were immediately dispatched and are currently conducting pursuit operation against the NPA rebels that fired at the CAFGU detachment. “While we are inviting the rebels to return to the mainstream of the society and spend their productive years nurturing their families thereby contributing to peace and progress of Northern Samar Province, we remain committed to ensure the security and well-being of our people,” he added. QUEZON CITY – A coalition of labor groups called Nagkaisa had asked the Bureau of Internal Revenue (BIR) Commissioner Kim Henares to approve their proposal to enhance the current fringe benefits and improve taxes on minimum wage received by employees as part of Aquino administration overtures for workers on May 1 Labor day. Trade Union Congress of the Philippines (TUCP) spokesman Alan Tanjusay said the idea is part the eight issues finalized April 9 between Nagkaisa and select members of the cabinet in a series of dialogues since 2012 for approval of President Aquino on or before the traditional May 1 Labor day breakfast with labor sector in Malacanang Palace. He said the group believed these issues were the agenda in a cabinet meeting with Aquino Friday last week. Philippine Airlines Employees Association (PALEA) president Gerry Rivera said Nagkaisa is pushing for Henares to impose tax only on the incremental amount of the negotiated minimum wage and not the entire amount itself. "If union workers, for example, were able to successfully negotiate for a P10 wage increase on top of their minimum of P500 a day, we want only the added P10 to be taxed and not the entire P510," Rivera said adding: "we desire it to be like this in reverence of and to preserve the sanctity of collective bargaining negotiations between the worker and his employer. It's useless to negotiate for a higher wage if the entire amount is taxed." At the same time, he said the Nagkaisa is also campaigning for BIR to revise the current version of the de minimis fringe benefits enjoyed by unionized or regularized workers. Not subject to any tax, the de minimis benefits are facilities or privileges given or offered by an employer to its employees but such are relatively small value but offered or given by employers as a means of promoting the workers' health, company goodwill, contentment or efficiency of its employees. The Nagkaisa proposal is to revise the (1) monetized unused vacation leave credits from the current 10 days to 15 days; (2) retain the monetized value of vacation and sick leave credits paid to government officials and employees; (3) medical cash allowance to dependents from P750 to P1,500 per employee per month; (4) rice subsidy from P1,500 to P2,500 or 1 sack of 50kg of rice per month; (5) uniform and clothing allowance from P4,000 to P6,000 per year; (6) actual medical assistance – e.g. medical allowance to cover medical and healthcare needs, annual medical executive check-up, maternity assistance and routine consultation from P10,000 to P15,000; (7) laundry allowance from P300 to P900; (8) employees achievement awards in the form of tangible personal property other than cash gift or gift certificate with annual value not exceeding P10,000 to P15,000; (9) gifts given during Christmas and major anniversary celebrations from P5,000 to P10,000 per year per employee; and (10) daily meal allowance for overtime work and night/graveyard shift from 25% to 34% of the basic minimum wage per region. "If the proposed revisions are approved by BIR, it will encourage more employers to provide fringe benefits to their employees. On one hand, the employees will be happy. And if employees are happy, then they will be more productive and loyal to the company," said Sonny Matula, president of the Federation of Free Workers (FFW). Bukluran ng Manggagawang Pilipino (BMP) president Leody de Guzman, said that apart from enhancement of tax exemptions, the Nagkaisa is also pressuring for Aquino to criminalize and eliminate contractualization of labor, enhance labor rights by deterring union-busting and actively prosecute extrajudicial killings of labor organizers and journalists, institutionalize core labor standards in the agro-industrial plan, address affordability and supply sufficiency of power, reform key provisions of EPIRA law, labor representation in the Energy Regulatory Commission (ERC), provide affordable housing program and non-violent transfer of urban poor communities from danger zones, ratification of ILO Convention 151 – a convention concerning protection of the right to organize and procedures for determining conditions for employment in the government service, approve into law the Freedom of Information measure and ensure a jobs-led and workers' sector participation in the planning and implementation of programs of the rehabilitation and reconstruction of Yolanda-hit areas. Aside from the TUCP, some of the more than 40 other members of the Nagkaisa coalition is the Associated Labor Unions (ALU), Sentro, Alliance of Progressive Labor (APL), Partido Manggagawa (PM), Federation of Free Workers (FFW), Public Services Labor Independent Confederation (PSLINK), Bukluran ng Manggagawang Pilipino (BMP), Philippine Government Employees Association (PGEA), Association of Genuine Labor Organizations (AGLO), Kilusan ng Maralitang Obrero (KAMAO), Confederation of Independent Unions (CIU), Philippine Airlines Employee Association (PALEA). CAMP LUKBAN, Catbalogan City, Samar – The 8th Infantry Division, Philippine Army scored heavily against the New People’s Army rebels operating in Eastern Visayas during the 1st quarter of 2014. Based from 8ID accomplishment record for the 1st quarter 2014, the NPA rebels suffered blows in all fronts. On manpower, twenty six (26) rebels surrendered, seven (7) were arrested and one (1) was killed during an encounter, for a total of 34 rebels neutralized. On the part of the 8ID, one (1) soldier was killed in action, while two (2) were wounded in action. On firearms, troops recovered five (5) high powered firearms and fourteen (14) low powered firearms. Government forces incurred no loss during the period. 8ID was also able to hand over five (5) of the twenty six (26) towns of Samar Province and ten (10) of the twenty four (24) towns of Northern Samar Province to their LGUs as Manageable Conflict-Affected and Development-Ready areas (MCADR) which is a manifestation that the NPA rebels have lost their influence in these 15 towns that were handed over. The provinces of Samar and Northern Samar in their entirety are scheduled to be handed over by 8ID to their respective provincial peace and order councils in June 2014 and December 2014 as MCADR areas. In their desperate attempt to offset their setbacks and woes the rebels resorted to killing innocent people compounding their violations against people’s rights. During the period, the rebels perpetrated murders against four (4) innocent and hapless civilians. The NPA murdered one (1) former rebel, one (1) civilian, one (1) Cafgu Active Auxilliary or CAA and one (1) Army reservist. These commissions of heinous crimes by the NPA rebels will further alienate them from the people who already resent their extortion activities. “In the coming months, we will press on with the fight but we welcome peaceful resolution to this armed conflict being waged by the NPA rebels. To pre-empt violence, we invite all stakeholders to get involved in winning the peace by pressuring the rebels to return to the mainstream and to abandon armed struggle. We all need peace for the security and well-being of our people and sustainable development in the region,” he added. VP Binay - PHL no pushover, will defend territories "to the last blood"
MANILA – Vice President Jejomar C. Binay said Thursday evening that the Philippines is no "pushover" and will defend its disputed territories to the last blood, but only after all peaceful means have been exhausted. "Up to the last blood. I think that must be our position. That we are ready to die up to the last blood." "But as much as possible, we will always resort to peaceful means," the Vice President said after meeting some of the Marines stationed at the Ayungin Shoal detachment. 1Lt Mike C. Pelotera, TSgt Julio Ventoza, Pfc Mario Gerlene Pajarillo, Cpl Rogelio Tabilisma, Tsgt Joselito D. Panganiban, and Sgt Edwin Galvan, members of the "Ayungin 9," met with Binay to relate their experiences at the BRP Sierra Madre stationed at the disputed shoal. The other members who were unable to meet with Binay are Pfc Ryan Esteban, Sgt. Rey Sarmiento, and Cpl. Sheffrey T. Luna. The "Ayungin 9" were replaced by fresh troops during the March 29 mission twice blocked by Chinese vessels. 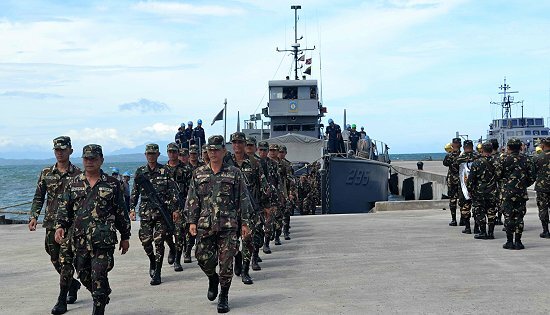 According to Binay, the fact that the Philippine Navy was able to send replacements to defend the shoal sends the message that the Philippines will always assert its sovereignty. The Vice President also expressed his pride at the actions of his fellow Marines, adding that all Filipinos should be "very proud" of their heroism. Binay is a reserve Marine colonel. "Kita mo naman iyong sacrifice doon. Katulad nito five months ito na-delay pa, dapat three months lang. Pero sabi nga, sundalo ay sundalo. Walang iyakan. I think when they were assigned there, that was in compliance with the order, so the order must have to be defended by all means," he said. Binay also expressed hope that relations between the Philippines and China will continue even while the issue of sovereignty over the territories is being resolved. He acknowledged that the resolution of the issue will take time. ODIONGAN, Romblon – Secretary of Health Enrique T. Ona, with Romblon Governor Eduardo C. Firmalo, Vice Governor Jose R. Riano and Congressman Eleandro Jesus F. Madrona, alongside regional and provincial officials, unveiled the new buildings at the Romblon Provincial Hospital, constructed under the Department of Health's (DOH) Health Facilities Enhancement Program (HFEP). The objective of the HFEP program is to upgrade health facilities and provide training to health professionals, and improve access of people to quality health care services. It also aims to enhance the delivery of basic, essential, and specialized health services in the community. The hospital was upgraded and modernized under the DOH-HFEP program with an allotment of P138,243,162.27 in 2010 and 2011 for Phase 1 of the project. It included the repair of the emergency room and intensive care unit, and the construction of a two-storey building for patients' wards, surgery and obstetrics, out-patient department, x-ray and additional offices for hospital staff. In 2012, it received an additional P118,499,301 and P140,000,000 for Phase 2 of the project. In his inauguration speech, universal health care champion Ona stressed that health is part of the major strategy for poverty reduction and inclusive growth which shall be felt by the poorest of the poor. "Government hospitals are for the people and if one does not like to be admitted or confined in such facilities, then there must be something wrong. In short, whether it is a government or private hospital, it must be best for all – the services must be the same, the facilities must be, in terms of diagnosis and curative aspects, must be the same. This concept is affirmed today, that public hospitals are not dilapidated but presentable," Ona said. The health chief was hailed "Father of Modern Health Facilities of the Philippines" by the newly-appointed DOH-MIMAROPA Regional Director, Dr. Eduardo Januario. The Romblon Provincial Hospital is a Level 1 health facility, with a 75-bed capacity and a 63 percent bed occupancy rate. It is operated by the provincial government of Romblon. According to hospital records, there were a total of 4,883 admissions in 2013, excluding the newborn. It also administered a total of 378 newborn screening tests, and discharged a total of 4,749 patients (alive). It provided in-patient service to a total of 17,250 patients. It caters to an average of 45 patients daily. Among its existing ancillary services includes a clinical laboratory for blood services, pharmacy, diagnosis, and x-ray and ultrasound services. "We thank the national government through the DOH for supporting our health programs especially facility development which is a vital necessity for a geographically isolated and disadvantaged area (GIDA) like the archipelagic province of Romblon," said Governor Eduardo C. Firmalo, a medical doctor himself. "One of our top priorities is health as embodied in our program H.E.A.R.T. (health, education and environment, agriculture, revenue generation, tourism, transparency and true public service) all for the people of Romblon towards sustainable and inclusive development," added Firmalo. Lone district of Romblon Representative Eleandro Jesus F. Madrona expressed his happiness that Firmalo managed to encourage private doctors to become consultants for Romblon's hospitals. "We need this kind of facility and we want our people to have the best health care through this facility towards a better life and we will support any measure that will increase the salary rates of our doctors," Madrona said. Madrona assured that the funding for the Phase 3 of the hospital shall be appropriated in the 2015 national budget. With a population of 289,867, Romblon is one of the provinces under DOH Region IV-B. According to the region’s 2013 Vital Health Indices, the province has a 19.68% (5,706) live birth and 5.32% (1,541) death rate. The leading causes of mortality in the province are heart diseases, pneumonia, cancer, cerebro vascular accidents, and hypertension. "This hospital is the symbol of hope for the people of Romblon' proof of the Aquino administration's commitment to the universal health care program for all," said Hospital Chief Dr. Benedict Anatalio. 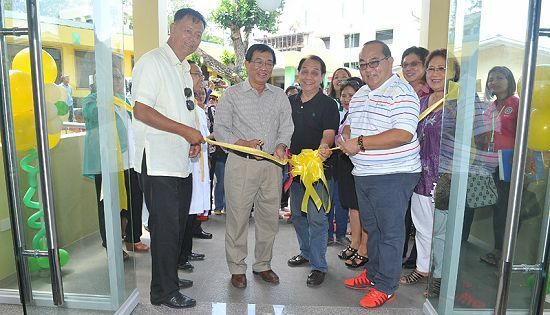 Also inaugurated were the Romblon Blood Collection Unit and the Conference Hall. Other personalities present during the ceremonies were the vice mayors of Romblon, barangay officials of Odiongan town, Provincial Health Officer Ederlina Aguirre, and various health workers in the province.